What’s for dinner? Serve up these outstanding Instant Pot Honey Bourbon Pork sandwiches this week. 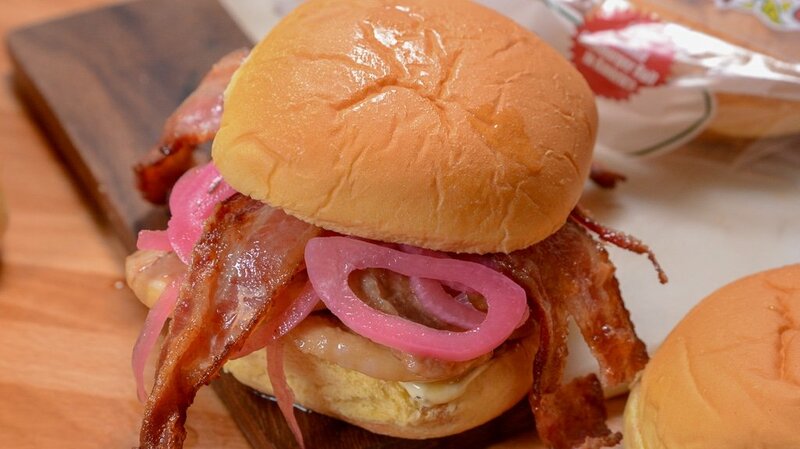 The ultimate tangy and sweet sandwich that is topped with pesto mayo and pickled onions and crispy bacon. Your family won’t know what hit them! My cousin Jamie is the driving force behind this sandwich, she created it and said I had to share it. She is so creative in the kitchen, it always amazes me what she cooks up! These honey bourbon sandwiches will hit the spot. Thinly sliced pork that is so tender, and cooked in a honey bourbon base. Toss in a bun and pile on your toppings and dive in. Don’t forget the napkin! Now if you didn’t want to serve this on a bun you could make a bowl with rice or cauliflower rice instead. Or cook up some egg noodles and pile the pork on top. Our preference is a sandwich but you can always play around with how to serve. Whoever had the idea of pairing bourbon and pork together was a genius! Bourbon pulled pork, grilled pork chops, and bourbon or my version honey bourbon pork. It all works so well! If you are a fan of the mix of savory and sweet this is a terrific recipe. You have the mix of tang added in from the pickled onions. If you haven’t tried pickled onions you are totally missing out! Ninja Foodie or Air Fryer Steak Fries | These are a nice side to pair next with your sandwich. Crispy outside and tender inside fries. Salty Chips | Grab your favorite chip and pair with your sandwich. It will pair nicely and offset the sweet and tangy. Copy Cat Bacon Ranch Pasta Salad | We make this up for the summer and it is outstanding. Creamy, tender pasta, and loaded with ranch flavors. I prefer to use a thin slice of pork for this sandwich. I find it offers the most tender meat. If you can’t find a thinner boneless pork chop you can always place in between plastic wrap and tenderize and flatten it out. Whether with a rolling pin or meat tenderizer. Give this honey bourbon pork a try! 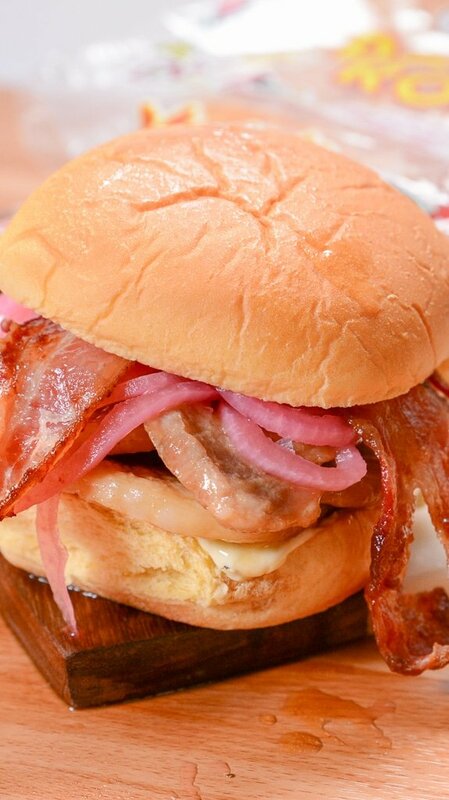 Don’t forget to drizzle on extra honey bourbon glaze to top the sandwich on and it is going to rock your world. What’s for dinner? Serve up these outstanding Instant Pot Honey Bourbon Pork sandwiches this week. 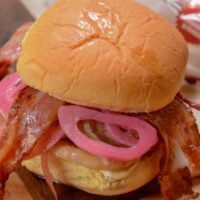 The ultimate tangy and sweet sandwich that is topped with a pesto mayo and pickled onions and crispy bacon. Your family won’t know what hit them! Place your pot on saute. Brown pork on both sides for 1-2 minutes. Pickled Onions, Bacon, and pesto mayonnaise.